It's getting late enough in the day that I need to go ahead and post the menu for this week. 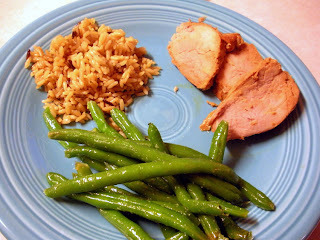 Below is a picture of the meal we had last Monday . . it was as tasty as it looks. 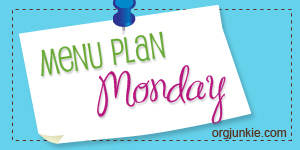 I am again submitting this menu to Menu Plan Monday over at I'm an Organizing Junkie. Pre-heat oven to 350. Mix all ingredients (minus pie crust) together until everything is well combined. Pour ingredients into one pie crust and then top with the other crust. Be sure to cut an opening in the center of the top crust and seal the edges. Bake for about 45 minutes or until pie crusts are done and insides are hot.